What would you tell my mother? A few weeks ago I spoke to the residents of a senior center in Milwaukee's central city. It was diverse group of older working class men and women - a Vietnam vet, a disabled County employee, a retiree from A.O.Smith, a retired nurse. Not surprisingly, all were supporting Barack Obama. After the discussion, a couple of women approached me with a concern. I had heard before when a colleague told me that her 82 year old mother and several friends were afraid to vote for Barack Obama because they feared for his life. Little did I know at that time that the McCain Palin campaign would launch the most vicious personal attacks on a presidential candidate in recent history. But history is informed by Douglas' insight. Let me tell you a story about my family that you could share with your mother. I had two aunts (women who survived and married my uncles) who were captured by the Nazis. One was imprisoned in Auschwitz. Her father, mother and youngest sister were murdered. She, her sister and brother were old enough to work so they were sparred. My other aunt, Mariam, was 13 years old, a child really, when Hitler's army invaded Poland. Her brothers, 18 and 19, were captured, strip naked and shot as she watched. Later she also witnessed the murder of her older sister and child. A local farmer hid my aunt. He provided her with a baptismal certificate, a medallion, some bread and water and said “Tomorrow is Sunday, lots of people will be on the road. Start walking and don't look back.” She did. Eventually she was captured. Her life was spared, but she was enslaved for several years. My aunts, both now dead, didn't often talk about that period of their lives. They took the farmers’ advice and tried not to look back. They lived with demons to be sure. But they tried to lead their lives with a dignity that belied their experience. My parents made sure I knew this history. They believed that silence in the face of injustice equals complicity; that without struggle there is no progress. So what would I tell your mother? I would tell her that the blood and sweat, the hopes and dreams of her parents and those who came before are now embodied in the movement to elect Barack Obama. He carries my aunts’ dreams for a decent world as well. If we let him down, out of fear, we are letting anyone who has been unfairly treated or struggled for justice down, and we are letting ourselves, our children and their children down as well. Barack is demonstrating that we have one life and we should live it with purpose. Talk to your mother. We need her vote. My aunts needs her vote. History needs her vote. VOTE FOR CHANGE ON NOVEMBER 4th! VOTE! As academic researchers on economic development and workplace productivity, we urge Milwaukeeans to vote YES on the city’s sick leave referendum. Milwaukee has the seventh highest poverty rate in the nation, a 51% African American male jobless rate and the largest racial disparities in unemployment and poverty in the country. 43% of the city’s workers earn less than $20,000 a year and many are among the 122,230 Milwaukeeans (47% of the private workforce) who do not have paid sick days. In this economic context, everyone agrees that Milwaukee needs more family-supporting jobs. Yet, employment that lacks paid sick days forces employees to choose between their jobs and caring for their families. A job that does not provide employees with paid sick days so they can care for their families is not a family-supporting job. • It creates public health obstacles to workplace productivity, forcing sick employees with contagious diseases to work. Opponents say mandatory paid sick days are a worthy objective but not economically viable. Some have even invoked the possibility of recession as a reason to oppose improving our city’s workplaces. But these opponents simply offer the same discredited methodology and arguments that backward employers and their academic apologists have used throughout history in opposing child labor laws, the minimum wage, workers compensation, clean air and water regulations and virtually every other labor standard this nation has adopted. In every case the opposition characterized the new labor or community standard as a job killer. And in every case, after the standard was established, the business community adapted, the economy grew and our country, its workers and their families were better for it. In the 1990’s business lobbyists used the very same arguments now being used against paid sick days to oppose raising the minimum wage. But after states and even cities raised their wages above the national minimum, economists found that the chicken little scenarios of the opponents did not occur: that incremental increases in the minimum wage did not increase unemployment or cause minimum wage paying firms to lay people off. Facing similar dire warnings, San Francisco enacted a paid sick leave ordinance in 2007. However, despite an economic downturn affecting all counties in the Bay Area, San Francisco maintained a competitive job growth rate that exceeded the average rate of nearby counties. Internationally, of the twenty most competitive economies, only the United States does not guarantee its workers paid sick leave. Economies and firms can try to compete on price and cost. But in world where two billion people live on less than two dollars a day, Milwaukee will not succeed by trying to get poor. The only way Milwaukee can thrive is by getting smart- competing with high skill, high productivity, high-wage employees. Indeed, opponents of the sick leave referendum, such as the Metropolitan Milwaukee Association of Commerce (MMAC) point out that many of their members already provide paid sick leave. These MMAC members should welcome higher standards for all employers, which would protect them against unfair competition from businesses without standards, and would prevent a destructive race to the bottom in workplace standards. Providing all Milwaukee workers with paid sick leave is the right thing to do. It is also the smart thing to do because firms that treat their employees humanely benefit from increased commitment, inventiveness and productivity, the keys to competing in an increasingly competitive global economy. We urge the citizens of Milwaukee to VOTE YES on the sick day referendum. It turns out that Sarah Palin didn't come out of Alaskan tundra to be picked by John McCain as his vice presidential candidate. Richard Cohen reports in today's Washington Post that leading conservative intellectuals and activists were actively courted by Palin while cruising in Alaska more than two years ago. In 2007, several conservative journalists got off their cruise ships and met Sarah Palin. They saw the present, and she was a babe. The account of that summer of love comes from yet a third magazine, the New Yorker. In it, Jane Mayer detailed the efforts of the highly ambitious Palin to become well known in the Washington political-journalistic milieu she pretends, in proper demagogic fashion, to detest. After an apparently bravura saying of grace, she wowed her guests with some excellent halibut cheeks and the Category 4 force of her personality. Some of them sank into a kind of delirium known to high schoolers and praised her as "my heartthrob" (Kristol), "a mix between Annie Oakley and Joan of Arc" (Gerson) and, so far not evident, "smart" (Barnes). I received another McCain campaign mailer this weekend claiming that Barack Obama is a terrorist. McCain, Palin and the Republican Party have crossed the line with their McCarthyite attempt to associate Barack Obama with Bill Ayers and the Weather Underground. Their irresponsible and dishonest ads are promoting an atmosphere of fear and anger that increases the potential for violence against Barack Obama and his campaign volunteers. Barack Obama is a United States Senator, a former editor of the Harvard Law Review, constitutional law professor, and community organizer and a candidate for the President of the United States. His Grandfather fought in World War II. His Grandmother, gravely ill, was a bank Vice President. He is no more a terrorist than I am the Pope! Obama was 8 years old when Bill Ayers was active in the Weather Underground. The fact that Obama and Ayers, Chicago's Citizen of the Year in 1997, have served on some philanthropic boards together and live in the same neighborhood is irrelevant. I serve on several boards and know nothing about the personal or political histories of my fellow directors. Nor do I have any control over my neighbors political activities or their past actions even though I have been welcomed into their homes. William C. Ibershof, the lead federal prosecutor of the Weathermen in the 1970s, recently repudiated McCain's efforts when he wrote::" I am amazed and outraged that Senator Barack Obama is being linked to William Ayers’s terrorist activities 40 years ago when Mr. Obama was, as he has noted, just a child." It's a thoughtful letter that repudiates the McCain campaign's unprincipled attempt to malign Barack Obama for events that he had no role in. McCain's suggestion that Obama condones violence and intimidation to pursue political objectives turns American history on its head. Violence and terror have mainly been used as political weapons by the American right wing. Following the Civil War the planter class that had provoked the War by seceding organized violent, white supremacist paramilitary organizations like the White League in Louisiana and the the Red Shirts in Mississippi, North and South Carolina, to terrorize and murder African- Americans for exercising their newly won freedoms. Black political participation declined precipitously, reconstruction was betrayed and African Americans were stripped of their constitutional rights for almost 100 years. The terrorist Ku Klux Klan enforced the post-reconstruction system of racial segregation (Jim Crow) throughout the south through beatings, cutting off fingers, burning down houses, and destroying the crops of African Americans. Murder was common. There were 5,000 lynchings which were often treated like festivals by white families enjoying the spectacle of execution as entertainment in the post Civil War period. More often, victims were lynched by a small group of white vigilantes under the cover of night. While hanging was most common, some victims were beaten, burned, stabbed, shot, or slowly tortured to death. Violence was also been routinely used against American workers for trying to bring democracy to the workplace. Workers were routinely fired, evicted from the company owned housing, beaten and murdered for simply trying to organize. From the Colorado and West Virginia coal wars through Andrew Carnegie's use of the Pinkerton National Detective Agency to the Henry Ford's secret police headed by the notorious Harry Bennett, terror was employed by employers against their own employees. More recently, terror was used by states rights extremists against Americans organizing non-violently to extend citizenship rights to African Americans. Emmitt Till, Medgar Evers, Michael Schwerner Andrew Goodman, James Chaney, and Viola Liuzzo among others were brutally murdered. Others were viciously beaten, including Georgia Congressman John Lewis, and hosed. Bombings, most notoriously of the 16th Street Baptist Church, were frequent. Pro-life terrorists bombed and burned women's health clinics and murdered doctors who performed legal abortions more than 150 times between 1982 and 1996. McCain and Palin's attempt to undermine Barack Obama's growing support by labeling him a terrorist has not worked. It won't because he is not and because the American people have real concerns like the losing their jobs, their homes, their life savings, their health care and their sons in daughters in an ill conceived war. But by suggesting that Barack Obama is a terrorist and associating him with the 9/11 attack on America, McCain and Palin are creating an atmosphere of hate and fear that is fertile ground for extremists among their followers. If there is, God forbid, an attack on Barack Obama, the blood will be on their hands. Remember when Sarah Palin talked about being a plain old hockey mom, a self-described pitbull with lipstick? Well today we learned that Ms. Palin's been buying a whole lot of lipstick, and rouge too. Or at least her traveling makeup artist, Amy Strozzi, was. Now hockey moms know all about traveling teams. But traveling makeup artists? Not so much. It turns out that Ms. Strozzi was the highest paid McCain staffer for the first two weeks of October taking home a sweet $22,800. Not only that. Ms. Palin also has a traveling hair stylist, Angela Lew. She pocketed another $10,000. And earlier this week we learned that the Republican Party dropped a cool $150,000 at Neiman Marcus and Saks Fifth Avenue, not your typical hockey mom turf, outfitting Palin. Of course, the serious issue is the McCain campaign's hypocrisy in trying to paint Senator Barack Obama as an out of touch elitist when it is John "I don't know how many houses I own" McCain and Sarah "Neiman Marcus" Palin who have tastes the rest of could only dream about. After the last presidential debate, John McCain declared Joe the plumber the winner. A day later we learned that Joe's name was Sam and he wasn't really a plumber. More importantly, Joe better watch out. John McCain's hand is in his pocket. Despite productivity increases of almost 20%, plumbers, pipefitters and steamfitters haven't done well over the last eight years of Bush inspired high income tax cuts, the kind that John McCain wants to make permanent. Almost all of the economic gains of the past eight years have gone to the wealthiest Americans. The richest 1% of Americans, averaging $1,5 million annually, capture more of the nation's income than at any time since 1929. The average working family earns less today in real dollars than they did in 2000. John McCain's Republican Party has presided over one of the largest redistributions of income and wealth in American history. McCain, one of the richest men in the senate, isn't opposed to redistribution. He just prefers to redistribute it upward. His approach is less like Robin Hood and more like Robin Hood in reverse! Winner of the Noble prize in economics, Paul Krugman, writes about this and more in his latest NYT's column. 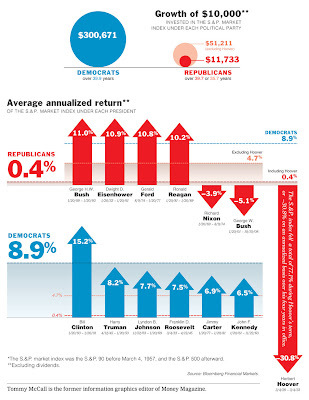 On November 4th remember which political party is been better for your wallet? Former Secretary of State Colin L. Powell endorsed Senator Barack Obama for president on Sunday morning as a candidate who was reaching out in a “more diverse and inclusive way across our society” and criticized the McCain campaign for its negative campaign. The endorsement, on the NBC public affairs program “Meet the Press,” was a major blow to Senator John McCain, who has been a good friend of Mr. Powell for decades. Mr. Powell told reporters after the taping of “Meet the Press” that he had been disturbed in recent weeks by the negative tone of Mr. McCain’s campaign, particularly its focus on Mr. Obama’s passing relationship with William Ayers, a 1960s radical and founder of the Weather Underground. The McCain campaign has sought to promote the idea that Mr. Obama is “palling around with terrorists,” in the words of Mr. McCain’s running mate, Gov. Sarah Palin, because of Mr. Obama’s weak links to Mr. Ayers. Mr. Powell also told reporters on Sunday that he was troubled that a number of Americans believe that Mr. Obama is a Muslim, although he did not directly link that supposition to the McCain campaign. In his interview he criticized those suggesting Obama is Mulsim on factual grounds because Obama is a Christian. But Powell went on, citing the a death in combat of a Muslim American soldier, to say that Muslim Americans are citizens with the same rights as all Americans. Joe ain't a plumber, but Milwaukee's Al is and he is voting for change! Joe the Plumber's story sprang a few leaks Thursday, a day after John McCain referred to him 21 times in the presidential debate with Barack Obama and declared him the real debate winner. Joe the Plumber ain't a plumber at least not a licensed one. His name isn't Joe. It's Sam. And Joe or Sam, whatever, is concern about increased taxes - but hasn't paid his own. He owes Ohio about $1,200 in personal income taxes that he hasn't paid, according to the Lucas County Court of Common Pleas records. As a result, Joe has an active lien on his property filed in January 2007, records from the Ohio Department of Taxation show. The Toledo Blade, examining Lucas County Building Inspection records, reported that…"Mr. Wurzelbacher said he works under Al Newell's license, but according to Ohio building regulations, he must maintain his own license to do plumbing work," the newspaper said. "He is also not registered to operate as a plumber in Ohio - which means he's not a plumber." What else did Americans learn about average Joe this week? He is registered as a Republican, and voted in the state's GOP primary in March, county elections records show. He was previously registered, dating back to 2007, in the Natural Law Party. So we’re takin’ it back with Barack, Jack! Takin’ it back with Barack, Jack! Cause he’s the best we got and did I ….mention he’s black? Noble Prize winning economist and New York Times columnist Paul Krugman writes that now is not the time to worry about deficits. One can only hope Congressman Paul Ryan, an unrepentant deficit hawk, and the Milwaukee Journal Sentinel editors are paying attention. The engines of economic growth, consumer spending, fueled by private debt through most of the last two decades, and private investment are stalled. The only way to get the economy moving is to increase government spending. But state and local government are legally required to balance their budgets. They cannot increase spending. They will be forced to cut it which will make the downturn worse. Last year state and local government spending was one of the only engines of economic growth and job creation, increasing by $40 billion. Now Wisconsin is facing a $3 billion deficit. California just slashed its budget by $7 billion. Next year states will be forced to cut their spending by at least $60 billion, and that number is rising. That amounts to a $100 billion reduction in demand that will make what is shaping up as a nasty recession worse. Interest rates are already extremely low. They need to be cut again. But that won't be enough. The only policy left is to use deficit spending to jump start the stalled economy. It’s now clear that rescuing the banks is just the beginning: the nonfinancial economy is also in desperate need of help. ...there’s a lot the federal government can do for the economy. It can provide extended benefits to the unemployed, which will both help distressed families cope and put money in the hands of people likely to spend it. It can provide emergency aid to state and local governments, so that they aren’t forced into steep spending cuts that both degrade public services and destroy jobs. It can buy up mortgages (but not at face value, as John McCain has proposed) and restructure the terms to help families stay in their homes. ...it’s a shame that Mr. McCain hasn’t come up with policies that would actually help workers. Instead, he’s served up the same-old trickle-down theories and a government-is-wrong, markets-are-right fervor that helped create this economic disaster. Wednesday night’s debate was another chance for Mr. McCain to prove that he is ready to lead this country out of its deep economic crisis. But he had one answer to almost every economic question: cut taxes and government spending. Unfortunately, what Mr. McCain means is to cut taxes for the richest Americans and, inevitably, to reduce the kinds of government services that working Americans need more than ever. ..
Mr. McCain’s biggest problem is that he has no big ideas for fixing the country’s problems. His speech on the economy this week was replete with seriously bad ones, starting with cutting the already very low capital gains tax in half. That won’t rescue the economy. What it will do is dig the government further into debt while making the current tax structure that rewards the rich even more unfair. Mr. McCain made more sense when he proposed eliminating income tax on unemployment benefits in 2008 and 2009. He would have done a lot more for struggling Americans if he had pressed his party earlier this month to help extend expiring unemployment benefits. Mr. McCain says he wants to help Americans threatened with foreclosure by using federal money to purchase loans that exceed the value of the home. A better approach — one that would not overburden the taxpayer — would be to allow a bankruptcy court judge to modify mortgage terms. Mr. Obama has long supported that change. Mr. McCain has not. Mr. Obama has better ideas to respond to the financial crisis and to put the economy back on the right track. He supports a 90-day moratorium on foreclosures and more money for states and localities, both of which would quickly bring relief beyond Wall Street. Mr. Obama wants to raise the minimum wage and tie it to inflation. Mr. McCain wants to make the Bush tax cuts permanent — a big break for the top 1 percent of society. Mr. Obama would cut taxes for low- and moderate-income families and raise them for richer Americans. As for how Mr. McCain would create jobs, his big idea in Tuesday’s speech — surprise, surprise — was that “the most effective way a president can do this” is to use “tax cuts that are directed specifically to create jobs.” After the last eight years, that pinched view of government ought to sound depressingly familiar to the millions of Americans who are still waiting for that downward trickle of prosperity. Last night John McCain tried to distance himself from George Bush when he said: "I'm not George Bush." In his latest ad, Barack Obama responds:"You may not be George Bush, but you voted with him 90% of the time." Palin's geography: bobcats, moose and my hometown! Sarah Palin drew some boos and shouts of confusion from her supporters yesterday, when while speaking in New Hampshire she mistakenly claimed that the Granite State was part of the "great Northwest. "I like being here," she told the crowd in Laconia, "because it seems like here and in our last rally too -- other parts around this great Northwest -- here in New Hampshire you just get it." I grew up in New Hampshire, on Oyster River Road in Durham, to be exact. Went to Oyster River High School and played ice hockey for the Bobcats, although we never saw one in Durham or there abouts. No moose or hockey moms either, although I hear there are plenty of both in the state now. New Hampshire was in the Northeast, you know, bordered by Massachusetts, Maine and Vermont, when I left in 1966 to attend the University of Wisconsin. It's still there as far as I can tell. McCain smear campaign has crossed the line! There is a fine line between a smear campaign and an incitement to violence. The McCain Palin campaign has crossed that line. The Obama campaign has declared Tuesday, October 14, Early Vote Day in Wisconsin. Senator John Kerry will be visiting various cities throughout the day to promote early voting. And at 1 pm, Senator Lena Taylor, will speak to MATC students about citizenship and the right to vote, at the downtown campus in S120. The speech will be followed by a march to City Hall to early vote. On Sept. 7, 2006, Nouriel Roubini, an economics professor at New York University, stood before an audience of economists at the International Monetary Fund and announced that a crisis was brewing. He warned, the United States was likely to face a once-in-a-lifetime housing bust, an oil shock, sharply declining consumer confidence and, ultimately, a deep recession. He laid out a bleak sequence of events: homeowners defaulting on mortgages, trillions of dollars of mortgage-backed securities unraveling worldwide and the global financial system shuddering to a halt. These developments, he said, could cripple or destroy hedge funds, investment banks and other major financial institutions like Fannie Mae and Freddie Mac. The audience was skeptical, even dismissive — and not without reason. At the time, unemployment and inflation remained low, and the economy, while weak, was still growing, despite rising oil prices and a softening housing market. But Roubini was soon vindicated. In the year that followed, subprime lenders began entering bankruptcy, hedge funds began going under and the stock market plunged. The nation lost 760,000 jobs, the dollar deteriorated, evidence of the huge housing bust and growing panic in financial markets as the credit crisis deepened. By late summer, the Federal Reserve was rushing to the rescue, making the first of many unorthodox interventions in the economy, including cutting the lending rate by 50 basis points and buying up tens of billions of dollars in mortgage-backed securities. Roubini was one of the few prominent economists who predicted the nation's financial crisis. At this point severe damage is done and one cannot rule out a systemic collapse and a global depression. It will take a significant change in leadership of economic policy and very radical, coordinated policy actions among all advanced and emerging market economies to avoid this economic and financial disaster. The entire piece is linked. Robert Kennedy-McCain, Palin and the Alaskan Independence Party! Robert F. Kennedy Jr., noting that Sarah Palin and her husband have been affiliated as recently as two years ago with the Alaskan Independence Party whose aim is to secede from the United States asks:"... isn't it time the media start giving equal time to Palin's buddy list of anti-American bombers and other radical associates? It's a thoughtful indictment of the McCain Palin campaign's use of McCarthy era-guilt-by- association tactics and of the media for allowing itself to be manipulated into focusing on non- issues. The New York Times has shifted the ratings of three states on its Electoral Map, reflecting the difficult stretch that Senator John McCain, the Arizona Republican, is going through in his fight with Senator Barack Obama, the Illinois Democrat, for the presidency. New Hampshire, which The Times had rated as a toss-up, is now shifted as leaning to Mr. Obama, based on polling and interviews with Republican and Democratic officials. The Granite State was good to Mr. McCain in the Republican primaries of 2000 and 2008, and considering that history – and the large number of independents in the state – it remains high on the list of Democratic states that Mr. McCain had been seeking to capture this November. North Carolina, a state that is normally is about as red as they get, is being moved into the toss-up column. Mr. Obama has poured tons of money into the state, and is spending a lot of time there, and Republicans are growing increasingly anxious that he might take it away from them. 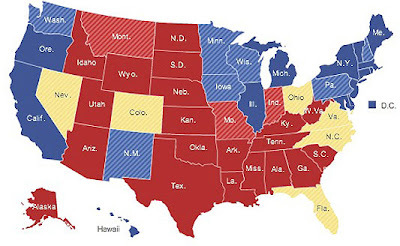 Oregon, which had been leaning toward Mr. Obama, has now gone from light to solid blue. N.Y. absentee ballot misspells Barack Obama's name Osama! Two days after the New York Times reported that tens of thousands of eligible voters in at least six swing states have been removed from the rolls or have been blocked from registering in ways that appear to violate federal law, the Times Union from Rensselaer County, New York reports that Democratic presidential candidate Barack Obama's last name is spelled "Osama" on hundreds of absentee ballots mailed out this week to voters. I have attached a scanned copy of the ballot. McCain skips GI Bill vote for fundraiser! Is that putting country first? Over the past week a wide range of polls show increased electoral support for Barack Obama and declining support for John McCain. As a result, it was assumed that McCain needed a "game changing performance" in last night's town hall debate. Post debate polls indicate that that did not happen. Will Obama will make the right decisions on the economy? Will McCain will make the right decisions on the economy? Less than half of undecided voters think McCain will do the right thing on the economy, over 2/3rds think Obama will. Who expressed his views more clearly in the debate? Who seemed to be the stronger leader? Palin resurrects dire warning against dangers of Medicare! What was the threat to American freedom that Reagan feared? Incredibly, it was Medicare, the nation's old age health insurance system. The quote comes from a a recording Reagan made for Operation Coffeecup — a campaign organized by the American Medical Association to block the passage of Medicare. Doctors’ wives were encouraged to organize coffees for patients, where they would play the Reagan recording, which declared that Medicare would lead us to totalitarianism. Medicare has been around since 1965. Former President Harry Truman was the first person to enroll in the program. Republicans have tried to undermine it through cuts and underfunding ever since, but it remains an efficient and valuable program that provides basic coverage for millions of senior citizens. Reagan was employing scare tactics in a futile effort to stop legislation that the Republican Party opposed. What was Palin thinking, or was she, when she resurrected a projection that was so wrong? Maybe Tina Fey will provide us with an answer Saturday night! Sievert notes the richest 1% paid 39.9% of federal income taxes. But Sievert's is cherry picking. Income taxes are only one of several federal taxes. Sievert ignores the impact of Social Security (6.2%) and Medicare (1.45%) taxes. Middle class workers pay a much higher percentage of their income in these taxes since the Social Security tax is zero percent after $102,000. For the self employed these tax rates are an even higher, 15.2%. And social insurance taxes do not apply to capital gains and dividend income, most of which goes to high income folks. If you include the taxes Sievert ignores, the average federal tax rate for the richest 1% falls to 22%, the lowest tax rate paid in at least 18 years. How does the 22% rate paid by the super rich compare to what the middle class pays? Taxpayers making between $100,000 and $200,000 paid nearly the same rate, 20.6%. Those in the $50,000 to $75,000 range paid 17.4%; even taxpayers earning a very modest $40,000 to $50,000 paid 15.8%. Sievert also ignores that the richest one percent's portion of national income has soared to its highest level since 1929. Put simply the richest 1% pay more in income taxes because they are making so much more than everyone else. But their federal tax rate is not much higher than that paid by firefighters, welders, nurses and machinists. Barack Obama’s proposal to roll back some of the Bush era tax cuts on folks making over $250,000 is a sensible and fair way to ensure that we have the resources to pay for social investments like education, healthcare, research and development, increased regulation of imports, security and infrastructure required to keep the country strong and its people safe and prosperous.